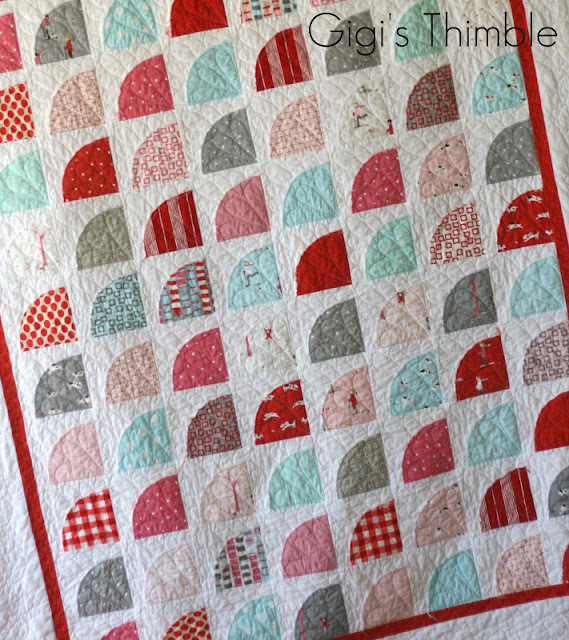 Gigi's Thimble: A Quilt for M.
Finally. My Snickerdoodle quilt is done. Bonnie Olaveson (Cotton Way) designed it. This pattern was super easy to make because of the raw edge quarter circles. I enlarged the size of the template a bit because it killed me to waste any last inch of the charm squares it called for. Speaking of charms, I used a Sherbet Pips charm pack (given to me for my birthday by my bro and sweet SIL - who know me well) plus some scraps from my stash. Shout Color Catchers to insure no bleeding! Then, into the dryer to get all soft and snuggly. Saturday I tried to have a photo shoot while little Miss M. jumped on the bed. We're both loving the light pink dot minky on the back. Super snuggly. And one outdoor shot...just for fun. 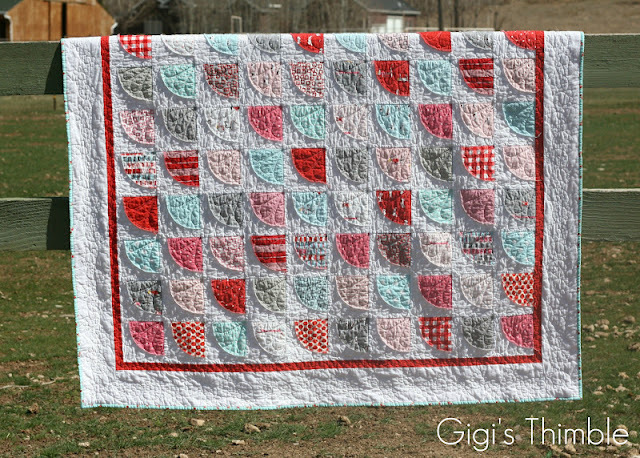 This is such a sweet quilt, Amber! Great use for some charms. And your daughter is so precious! That's adorable Amber! And Little Miss M looks just like you! I just love love love it... it's so adorable.. what an awesome job. I need to make one of these I just adore it. It looks great! Very sweet looking. Your quilt looks great and your daughter is so sweet. Thanks for the shout out! I have your arrow quilt made, but it isn't quilted yet. That's on my list of UFO's. Gorgeous quilt Amber. That last photo taken outside is amazing!!!! I love your quilt, it is really pretty. The back you chose adds a special touch :) That quilt pattern is on my list of to do's! What a sweetie! The quilt looks great and is just as it should be--loved by the recipient. I love this quilt! You pick such great colors. I appreciate you talking about washing quilts. I am so nervous to wash mine after I'm done, so I will try the color catcher method. I have one with all white minky and I'm scared it will come out pink! Absolutely beautiful Gigi, love the colours and it was so made for a little girl to bounce on :) Thanks for sharing. It is just adorable! I love it!! Adorable quilt and yes your little model is beautiful.